Las Cruces was established in 1849. 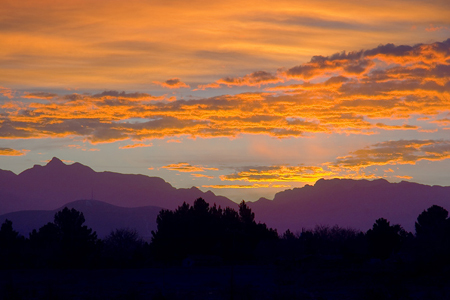 It is nestled between the banks of the Rio Grande and the mighty Organ Mountains. When Katherine Lee Bates wrote "America the Beautiful" she wrote, "for purple mountain majesties." She must surely have been referring to the Organ Mountains which turn purple in the evenings. It is truly a magnificent sight. Las Cruces is located 225 miles south of Albuquerque and 42 miles west of El Paso Texas. According to the new 2010 census, our population in the city is 97618, while the county population is 200,000. Las Cruces is home to the main campus of New Mexico State University. There are many cultural events which take place at NMSU. The Pan Am center is the host of off-Broadway productions such as Cats and Lord of the Dance. Some of the country's most well known performers can be seen there as well, such as: Carrie Underwood, Reba McEntire, David Copperfield, and Jeff Dunham, just to mention a few. The Pan Am Center is also home of the NMSU Aggies basketball team. Aggie Memorial Stadium is a 40,000 seat stadium and home of the NMSU Aggie football and soccer teams. Tickets can be purchased at the Pan Am Center directly or at www.ticketmaster.com. The Hershol Zohn Theatre is home of the American Southwest Theatre Company. The theatre has a 377-seat capacity. Season tickets can be purchased as well as tickets for individual performances. Average Yearly Rainfall is 8"
Average Yearly Snowfall is 2"
Number 6 on US News and World Report's 2010 "10 Cities for Real Estate Steals"
Number 19 on Sunset Magazine's "20 Best Towns of the Future"
One of AARP's 2010 "Best Places to Retire"
One of kaboom.org's 2009 most "Playful Cities USA"
One of Money Magazine's November 2005 "Best College Towns to Retire"